I'm so thankful for the opportunity to write the new Eyewitness Bible Study series for AMG Publishers. The first study in the series, Eyewitness to Majesty: Peter was released on January 14, 2013 and the second study, Eyewitness to Glory: Moses should be available later this year. 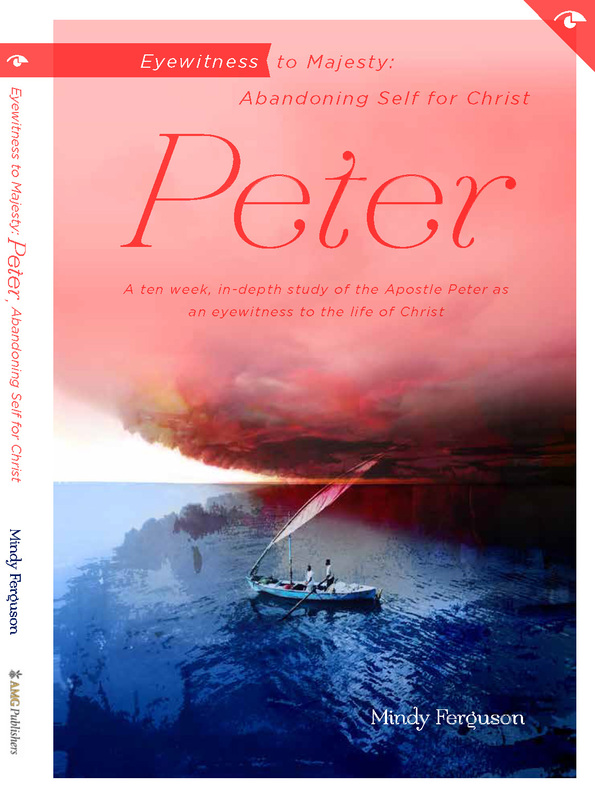 Through the Eyewitness to Majesty Bible study, we walk along with Peter as an eyewitness to the life of Christ. I found the Apostle Peter's story and perspective encouraging. The former-fisherman and zealous follower of Jesus is mentioned more times in the four gospels than anyone other than Jesus himself. Peter was praised more than any other disciple. He was also rebuked more than any other disciple. His imperfections make him lovable and his victories give us hope. The apostle Peter's relationship with Jesus reminds us that we serve a merciful, loving God who uses imperfect vessels to accomplish His divine tasks. If your women's group is looking for a fall Bible study, I would love for you to consider Eyewitness to Majesty: Peter: Abandoning Self for Christ. If you're like me, you'll grow in your relationship with our Savior as you see Jesus through the eyes of Peter. Selecting a Bible study for your organization or small group can seem overwhelming at times. To learn what others have to say about Eyewitness to Majesty: Peter, tap into my blog tour February 18th - March 1st. Those involved in the tour are women who love God and His Word. They will offer information such as reviews, interviews, and candid thoughts on this ten week, in-depth Bible study. You never know, you just might win a free copy by posting a comment on one of their blogs! Jesus said His Father’s house (the temple in that day and the church in ours) should be a house of prayer for all nations (Mark 11:17). Prayer is our connection with our heavenly Father; it is the means by which we communicate and build a relationship with Him. In the time when Jesus walked this earth, the Pharisees went through the motions in their religious activities, but their hearts were far from God. They seemed to know about God and about the history of His faithful provision, but they didn’t look for God’s activity in their daily lives. A prayer of Habakkuk the prophet. On Shigionoth. Habakkuk knew of God’s “fame,” and of His acts on behalf of His people. He cried out to God, asking Him to act again. He begged God to dazzle the people with His awesome deed—to do a mighty work among them. God faithfully brought His people out from under the oppression of the Egyptians (Exodus 12). He parted the waters of the Jordan River and brought His people into the land of milk and honey (Joshua 3 & 4). God preformed mighty works long ago, and He still performs mighty works today. The next time you face a trial, I challenge you to pray as Habakkuk did. I encourage you to locate an example in Scripture of when God moved in a mighty way on behalf of His people. Ask Him to do it again. Ask Him to do a work such as that in your life. He just may part the waters of dissension or strife and provide a clear path for you to find a “land of milk and honey” on the other side. Pray with eager anticipation and watch Him move on your behalf. -An adapted excerpt from Eyewitness to Majesty: Peter: Abandoning Self for Christ. Used with permission. Copyright © AMG Publishers, 2013. All Rights Reserved. What mighty works in Scripture inspire you to believe He will move in a similar way in your life today? Post a comment. Share a verse. Let's spur one another on to greater faith!